Stop fighting your mini mill’s Y axis! Between the axis not having a thrust bearing and the double nuts that hold the works together, the Y axis seems to have been an afterthought during the design process at the manufacturer. The factory gave the X axis two thrust bearings, but the Y axis none. Without thrust bearings and the axis relying on the nut/jam nut setup to keep the lead screw secured, friction in the setup can make Y axis movements very difficult. 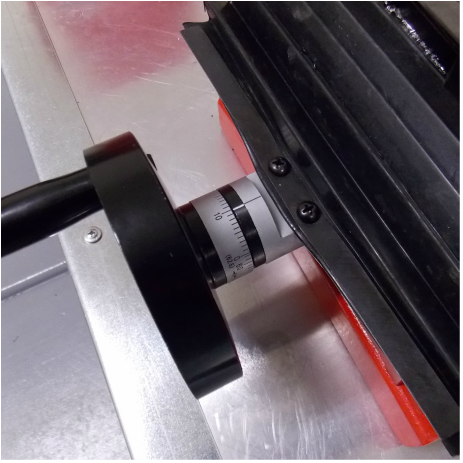 You can greatly improve your Y axis by installing our Thrust Bearing Upgrade. By placing a thrust bearing between the lead screw seat and the hand wheel dial, the friction in the setup is greatly reduced and the effort required to move the Y-axis is negligible. The whole works is held together with a locknut to replace the original double nut arrangement. A marked plastic bearing cover keeps the swarf out of the bearing and brings the reference line back to the dial at the hand wheel. You will receive a thrust bearing set (1 thrust bearing and 2 hardened bearing washers), a marked bearing cap and a lock nut. You will have to mill approximately 0.060” (~1.5mm) off the existing shaft key to make room for the new assembly. The shorter shaft key does not affect performance, as the bearing reduces the amount of torque required to move the axis. This mod should work with all Sieg X2 derived mini mills – Harbor Freight, Grizzly, Homier, etc. You may notice a small amount of intermittent vibration noise after installing the bearing. This is due to the one remaining bearing surface that is not running on a thrust bearing (the length of the lead screw prevents installing another bearing without removing metal from the lead screw seat). This noise has always been there, but depending on how tight your jam nut was, it may not have been noticeable. Applying a small amount of lubricant will help quiet the works.